Why buy used golf clubs? The answer is simple. Getting your clubs pre-owned lets you get the name brand you want, the new technology you want, or the equipment upgrade you want without spending more than you want. 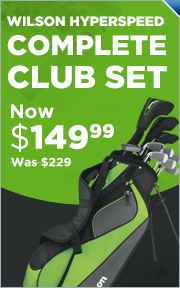 Why buy used clubs from GlobalGolf? With over 125,000 used golf clubs in stock, GlobalGolf has the largest selection of used golf clubs available online, bar none. From the tee to the green, we offer every type of golf club available in preowned condition. So whether you're shopping for drivers, fairway woods, hybrids, iron sets, individual irons, wedges, putters or even complete golf club sets - if you can swing it on the course, we've got one used. Our massive inventory also means we have clubs from the all top brands in golf - TaylorMade, Callaway, Ping, Titleist, Cobra, Cleveland and more. We love getting clubs from customers' trade-ins. You can trade-in your golf clubs right on our site, apply the trade-in credit to your current order, and then send us your old clubs later. But did you know over 80% of our used club inventory comes directly from the club manufacturers themselves? Through various partnerships and arrangements with some of the biggest brands in golf, we buy clubs they don't want anymore. Then we pass those savings onto you. Every club we have in stock has been evaluated by our trained staff, including PGA Professionals. Our trained golf club experts inspect every preowned club we receive for authenticity, dents, loose fittings, structural integrity and cosmetic blemishes. We strive to sell only the best used clubs, ensuring our customers are happy with the quality and condition of their purchase. On each used club product page, we provide a detailed description of our ratings so you know what to expect from clubs in different conditions. We also have representative pictures and videos of clubs in each condition option. With over a decade of experience selling used golf clubs on the internet, we have the staff, experience and expertise to get you a quality club in the condition you expect and at huge savings over buying brand new.